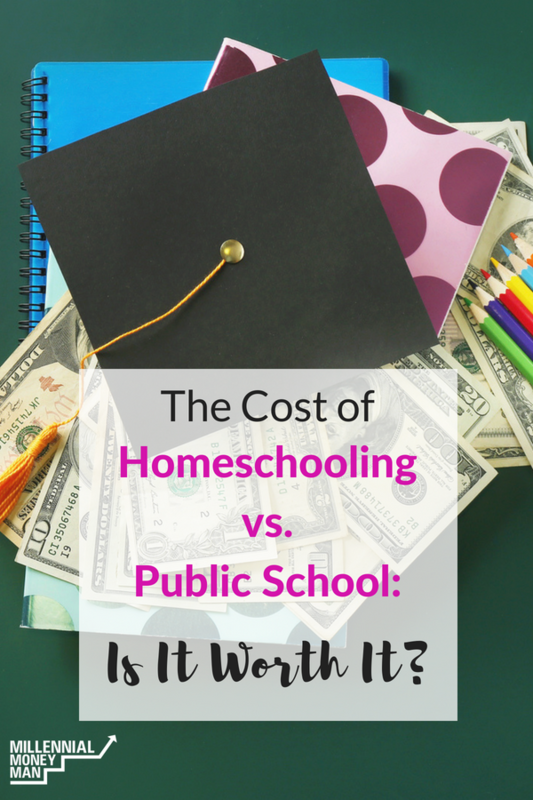 The Cost of Homeschooling vs. Public School: Is It Worth It? Yo everyone – I'm really excited about today's guest post by Melissa from Life 101 Pro! It's so weird – my wife and I don't have kids yet, but we actually have started talking about where they would eventually go to school (public vs. private vs. homeschool). I never – in my ENTIRE LIFE – planned to be a homeschool mom. They are quirky and have weird kids…then *BOOM* I got laid off, started volunteering in my son’s first-grade classroom and saw him slowly but surely falling through the cracks. I don’t blame the teacher – I have no clue how anyone can expect ONE adult to be able to teach 28 different precious kiddos well. *KUDOS* to all you teachers out there – YA'LL ARE ROCKSTARS! Deciding how to educate your child is such a personal decision that EVERYONE wants to give their opinion on. But really, it is just that – personal – your own. If cost really is a concern, this article is for you. This all about what homeschool cost us. When we decided to homeschool – every penny counted, because like I mentioned earlier I had just been laid off! Fortunately, you can actually homeschool for FREE! With sites like khanacademy.com and allineonehomeschool.com – you can easily get through all the required classes (plus some fun ones like Intro Pixar animation) at no-cost. Then all you need to do is keep up with all the paperwork for records. For my precious little 1st grader, I bought a $7 workbook at the Dollar Store and we made weekly field trips to the library and our education was covered. We did other “field trips” as well. Sure, we wanted to go to a petting zoo, but those are pricey. So instead, we would go to the local pet shop. I mean, how can a wall of amazing and different fish, not equal an aquarium?! The big thing we noticed was school doesn’t take 7-8 hours when you are home. It took maybe an hour that first year for EVERYTHING and 3-5 hours as the years progressed. So, finding ways to fill the day that didn’t break the bank was important. Luckily, we had a community pool, so our PE was fun and took another hour. He was an organizer, so I would have him match cards, dominos, SOCKS! Anything to keep him moving. Another lucky break was that we had 3 homeschool families in our community. So, we had weekly hangouts and got together for Valentine’s Day parties and things like that, but those events cost us nothing but our time…and a little construction paper. So, looking back – after homeschooling for 8 years, I say the biggest cost for homeschool is TIME. After that, we began scheduling time for me every week. It helped. The other cost, that broke my heart, was it cost me some of my dear friends. We enjoyed each other’s company and met for coffee monthly and bible study weekly. Then all the sudden I had a curious first grader in tow and soon we were no longer able to meet up. Finding friends in the homeschool world can be hard, but co-ops help. All co-ops are different, so if you and your kiddos can’t find a friend in one, try another. Co-ops are homeschool groups that cost about $20 a year and worth it to connect with other people in the homeschool tribe. Other homeschools, where you can drop your teen off and they can learn higher level classes can run $50 a year + cost for classes- a good $40-$75 a class per month. Classes vary. My daughter took ASL1, Spanish 1, World Geography and Computer Apps this year. My son took Algebra 1, Chemistry, Outdoor Leadership Survival Skills, Chess and English Comp. Those costs were a little steep, but I would say the benefits are even steeper when it comes to homeschooling. I thought I knew my kiddos. Then I began homeschooling them and got to *KNOW* them. I saw what really tickled their fancy and got them excited about learning. We had inside jokes about ketchup that we thought were HILLARIOUS! We, as a family really bonded together. Instead of heading to after-school activities most nights, now we were home playing board games and card games with them. We even started a few businesses – creating and selling handmade soap products and installing Christmas lights. The soap business taught us all real-life application of chemical reactions and creating art and the sad fact that P&L statements speak the truth (we had to close that one down because we could only seem to break even). The Christmas light installation company taught our kiddos work ethics and a job well done. There is such FREEDOM when it comes to homeschooling. Getting to choose what and how my kids learn a subject is PRICELESS. Being able to surround my teens with good peers and mentors, PRICELESS. Seeing my daughter, who graduated this year, leave our nest with a good head on her shoulders, a sweetheart – not hardened by the mean girls in public school and a game plan, as well as a budget for her future. WORTH EVERYTHING! Every tear. Every gray hair. Every “friend” lost. In 8th grade, my son decided he wanted to go to public school. We told him that was fine, but he would have to stay the whole year. And…he did. What that cost us: It cost us time, as he usually had 1-2 hours of homework and after-school activities like track. It also cost us some of his innocence. He had to read and re-read books that we would never have subjected his heart to reading, but that was what his English teacher assigned. The “cool kids” made sure he was exposed to things he shouldn't see as a young kid and crude ways of talking and looking at girls. Public school financial costs that year: School Supplies $75, driving to all the track meets all over + meals while there, +$75 in audio books. Private school financial costs: We used Schoolhouse Teachers at a cost of $80, or $10 a month. What he learned was priceless. He came home one day ½ way through the year and said, “mom, the kids act TOTALLY different at school than they do anywhere else.” That opened his eyes to how important it is to be who you are no matter where you are. I know MANY families who would never consider taking their kids out of public school and they thrive in that environment and for those families, I say, I am so happy for you. You do YOU! To all you considering the idea of homeschooling – consider the costs that your family will pay, the benefits that will come along with it, and then weigh your options wisely. You’ve got this. Melissa is the mom behind Life 101 Pro, a blog and website all about preparing teens for adulting. When she isn’t working on her business you can find her hanging out with her family, going on walks with her husband or having coffee with a friend. She loves connecting with other moms on the journey, so feel free to get in touch! Would you ever homeschool your kids? I wouldn’t home school my kids because I don’t think I would do a very good job with it. My daughter starts kindergarten in the fall and she’ll be in public school. I started in public school but graduated from a private (Christian) school. The private schools in our area are all really expensive, and honestly I don’t think the education is as good as the public schools in our area. Cyber school is a very possible option for our family as our kids get a little older. That’s interesting on the private schools! I guess I always just assumed that the private school education was potentially better because of lower student/teacher ratios or something. Cyber school is for sure something we would consider for our kids if we decide to travel a lot down the road. There were definitely some aspects of private school that were better. Student to teacher ratio was one of them. I’m sure this all varies based on the private school and the public school that you’re comparing. In my case, English was far more advanced in private school. Math and science were far better in public school. The biggest difference in my opinion was the options or lack of options. Most public schools have a lot of honors or advanced placement classes, electives, and high school students may be able to take some college courses during high school. Smaller private schools don’t always have those options to offer. The other issue, and this may vary by state, I had some teachers in private school who weren’t certified for the subject they were teaching. I had a science teacher that had to teach math because there was no one else to do it. That wouldn’t have happened in a public school (at least, not in Pennsylvania) because the requirements for private schools weren’t the same as for public schools. I was homeschooled myself, K-12 and all of my college courses are online, so I have only ever sat in a classroom setting once. (I ended up only going for the tests after 3 weeks.) I would recommend home schooling during the first 6-8 grades and then sending them to a high school that you heartily approve of. You can give a much better foundation at home. The only thing is, you HAVE to go out and teach them how to be social. That opens a lot of doors for serious conversations that are priceless. Yeah that would definitely be my biggest concern! I don’t want my kids to become adults with zero social skills haha. I was homeschooled from grades 1-12 and then went on to pursue an education in nursing. I am naturally an introvert, but the one thing I always notice about children that are homeschooled (myself included) is that we know how to hold a conversation with an adult from a very young age. Yes, friends are important, socializing with other children is important too, but that’s not the end-all. Family and real relationships are what I want my children to value. I homeschooled my kids for two years. For 4th-5th for my son and 3rd-4th for my daughter. It was hard but a great experience. My husband and I both work from home, which is the only way it was doable (for us) to homeschool and continuing working. Both kids are going back to school in the fall, but they will attend different schools (both are private schools though). We found what we hope is a good fit for each of them. Homeschooling isn’t a good fit for everyone–it isn’t a good fit for some parents and it isn’t a good fit for some kids. But I would encourage anybody who really wants to do it to give it a try. Each path–homeschooling, private, or public education–has its own drawbacks and benefits. We re-evaluate our choice each year since no choice is perfect and no choice needs to be permanent! I love that – you’re right about it not being permanent. When I was teaching we had kids coming from different places all the time (and leaving as well). I homeschooled my sons thru high school. I used an accredited high school so that people could see that they weren’t getting mommy grades (and to verify that yes they were taking a full high school load at age 9). They were on a gymnastics team that practiced 20 hours per week as well as church youth group, so they were “socialized” (such a weird term). I only homeschooled because our local schools didn’t know what to do with them. We did 3 languages, lots of history and literature, and more science experiments than I could count. Older son graduated college at 19 with a double math/physics major and as a member of a fraternity. Lol. Younger son is almost done with college but is currently working full time as a bartender. I had to give up my original career in order to do this (that’s a master’s degree I’m not using! ), but our finances were better with me staying home and homeschooling and working part time in another career than they would have been trying to afford the $15,000 each for the local private school that was willing to do more than have them be teacher’s helper. I had public school principals tell me to homeschool. I don’t think it’s for everyone, and it was hard hard hard work. But it worked for us. We had to learn to separate roles – teacher vs mom. But it gave us flexibility and allowed my kids to learn at their pace and not face ridicule for their interests. Yeah I can definitely imagine the financial situation being better by avoiding the private school costs. It definitely doesn’t seem to be for everyone, but based on what I’ve seen so far here and the private group I will definitely consider it! Wow that’s awesome! I’d love to do some volunteering like that eventually. So cool. No worries – didn’t seem scattered to me! I love what you said about getting them involved in other activities to socialize them well. That’s something that I’ve been concerned about with the homeschooling. I never considered anything besides public school before having kids. I didn’t attend the most funded schools in my district, but the teachers rocked and I learned to get along with every kind of person imaginable. Second, I feel like my tax dollars support schools, so why not benefit from the investment. But all of this changed with the school shootings. I’m not trying to politicize anything and I know anything can happen to you anywhere … but I was in high school when Columbine happened and things are not getting better.. I was always focused on my career and businesses, but since giving birth to 2 little ones, my priorities have changed completely. … I joined a few homeschool Facebook groups and am doing my due diligence. Thanks for this post! No I understand – I keep politics off the blog as well, but as someone who has done plenty of active shooter drills with my high school students and sat there realizing how bad it would be if/when it actually happened at my school…it’s a factor. Hopefully we get a better handle on that as a country by the time my kids are old enough for school, because I’d hate for that to be a reason to not do public school. Great post! I was private k – 2, homeschooled 3 – 8, and public for high school. Then I went to a Public University. – There’s no one solution for every family, or even every child. My brother and I thrived in different ways. – Homeschooling is like 90% on the parents. I saw myself and other kids thrive in a homeschool environment and then go on to be successful, and I saw others have a terrible time because the parents were lazy. I had a great experience homeschooling. For me, the 2 biggest things about my experience that helped were 1) My parents were super involved in socializing my brother and I. We were doing things with people all the time. 2) My parents put me in a speech and debate club from 5th – 8th grade and that was massive. It gave me the confidence to do public speaking. It also helped me understand how to formulate an argument and communicate my thoughts and points clearly. That experience alone set me up for success in a huge way. As for my family, we don’t yet have kids and ultimately it will come down to where in the country we end up settling and what the schools are like there. Private schools can be good but aren’t always well regulated. In my hometown, you paid a massive tuition for not much in return. Public schools are definitely hit or miss. I think we may end up homeschooling at least early on to give a solid foundation. Oh wow – I bet the speech and debate helped a lot! That’s something that I wish I had done looking back on it, even though I did have to do a lot of speaking in front of people as a teacher. Hey, MMM! I’m right there with ya – I’m approaching the Dirty 30 this fall and my hubs and I are doing the DINK life (Dual Income No Kids). We have also had the conversation about schooling for our future daughter and future son (we can choose, right?) and we both said public school because, well, that’s the system we grew up and we turned out okay. My friend is going to do homeschooling with her kids and I think it takes a lot of patience and understanding to be with your kids all day, IMO. Sounds like Melissa had a great experience. I also like the idea of doing Montessori albeit pricey. We are approaching very interesting times with the education system (private, public, higher ed)! We really are approaching some interesting times! Definitely! I was someone who said I’d never homeschool because I don’t have a lot of patience, lol. But my son is going into 3rd grade this fall and we’re doing private school for as long as we can. I don’t see my son staying in private school long-term seeing as how middle school is around $7,000+ per year and high school is $40,000 for all 4 years at his current school. Even if I had that money, I would probably want to put it toward something else like college savings. In the next few years though, I know he can do a lot of independent learning with online programs or we could even get a tutor and join homeschool groups if need be but homeschool is surprisingly becoming more of an option for us in the future. We started homeschooling our oldest child as a stop gap due to a military move during the school year. That was 22 years ago. We have since home educated all five of our kids through high school. Two have graduated college and are both military officers, one is a nursing student, and the remaining two are in high school. We never expected to homeschool permanently and always took it one year at a time. But it worked for our military career when we moved a lot and we kept on doing it once I retired from the military. There are so many resources and approaches to homeschool and never a shortage of opportunities for socialization (which is always the big concern one hears from those not familiar with it). If you’re interested in it, start by checking your local area for homeschool groups to learn more about it. On average we spend about $125 per student per month. That includes curriculum, supplies, classes, extra-curricular activities, sports, and field trips. Thanks for sharing this. No kids yet, but planning ahead. Helpful to know the costs and the fact that school doesn’t have to take hours. I went to a private school for elementary and there was only one class for my grade so I found myself bored most of the time. In public school, at least there were more options for taking specific classes that were on par with the speed of learning. Curious to see how this goes for us. I know home schooling takes time and it’s a new learning curve for parents too. My wife was homeschooled all the way through, and I was homeschooled 5th through 10th grade, public school on both ends. With homeschooling, we’re big fans of the co-ops, and finding the right one for your family. We’re going to make it a kid-by-kid, year-by-year decision for homeschooling our kids. We’ve got an 8-month-old now, so we’ve got four more years to make the initial decision. We don’t love the idea of farming our kids out to other influences that limit our voice for several hours a day. But we also don’t want to be perpetually afraid of what they might learn, see or hear. They will have to deal with this stuff as adults and know how to make their own decisions. Thank you so much for sharing this. It’s a common discussion between me and my mom friends who have pre-school age children. This post takes a few of the unknowns out of my thoughts regarding it. Most of my friends and I are leaning heavily towards the homeschool route. We did traditional hom school when my daughter was in 7th grade, and my son was in 3rd grade. Our state had wonderful program, where homeschoolers were given an allotment to use towards books, supplies, and extra-curricular activities. When we moved to another state, we found another wonderful option, which is online schooling. We go through a virtual charter school, which is considered a public school, so everything from books to supplies are completely supplied. The benefit is that our kids have online teachers for each subject, it’s very flexible, and they test the students every year to make sure that they are in the appropriate class. They have an official state transcript, which allows them to receive credit for their classes if they were to ever swap back to a traditional brick and mortar school. I also like have a state transcript for college applications. Our school coordinates socials every month, field trips, clubs, and the high school even offers options for concurrent enrollment for college courses. I love online schooling because I have more time, the teaching is done by professionals, and it’s kind of a sweet spot between traditional homeschooling and brick and mortar schools. We homeschool and love it. Our two oldest kids were able to dual enroll and graduated from high school with an AA degree, so started college with two years under their belt and no student debt. They had no issue getting into the college of their choice. Our oldest just completed grad school in December. Our next oldest started grad school this year. We used the Abeka DVD school – really high quality, but it does come at a cost. We supplement with co-op classes as well. An additional benefit is we can travel on off seasons when the cost is lower. We’ve been able to take the kids to Europe and China and across the US and Caribbean. It definitely can be a sacrifice and challenge for the parent staying home to be with the kids. Each family needs to make their own decision as to what is best for them. I love staying home with my kids, especially as they age and get more and more interesting! We use a self-led curriculum now, and my kids are done in 2-3 hours a day, leaving them afternoons free to read, bake, perform science experiments, take the toddlers on a picnic in our pasture, play games, or binge-watch 5-minute craft videos on YouTube. They take piano lessons and homeschool band, and are involved in various other activities at different times (art, Spanish, scouting clubs, co-ops, etc.). In our state they’re able to take free dual credit classes through the community colleges during high school and graduate with up to 60 college credits. I’ve had an awful stomach bug the last 2 days, and my kids have faithfully done their school work while cheerfully taking care of the chores and the little guys and their mama. I can’t think of better social skills than that.